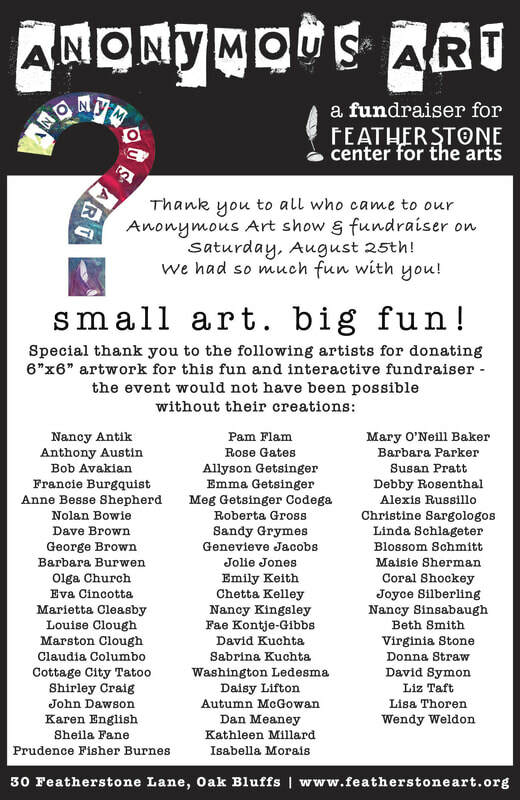 Anonymous Art show and sale - A fun and creative art show and fundraising event. Anonymous Art features 6"x6" works of art donated by local artists. All artwork will be anonymously created and identically sized 6"x6" with professional to novice artists participating. Attendees of the event have the opportunity to sign up for a chance to win the pieces of their choosing, not knowing who created the artwork. Bid sheets add an additional level of the unknown, with a roll of the die determining the winner! ​The inaugural Anonymous Art show in 2018 was a huge success and creative, exciting fun! Read about last year's event in this Vineyard Gazette article. Featherstone has 6"x6" canvases available for artists to pick up, or you may create your work of art on any 6"x6" surface (framed photography and multi-dimensional pieces welcome!). Please contact Posie Haeger via email or by calling 508-693-1850 with any questions or to sign up to participate. Deadline for entry for the 2019 event is Friday, August 16th. Thank you to 2018 participating artists below!